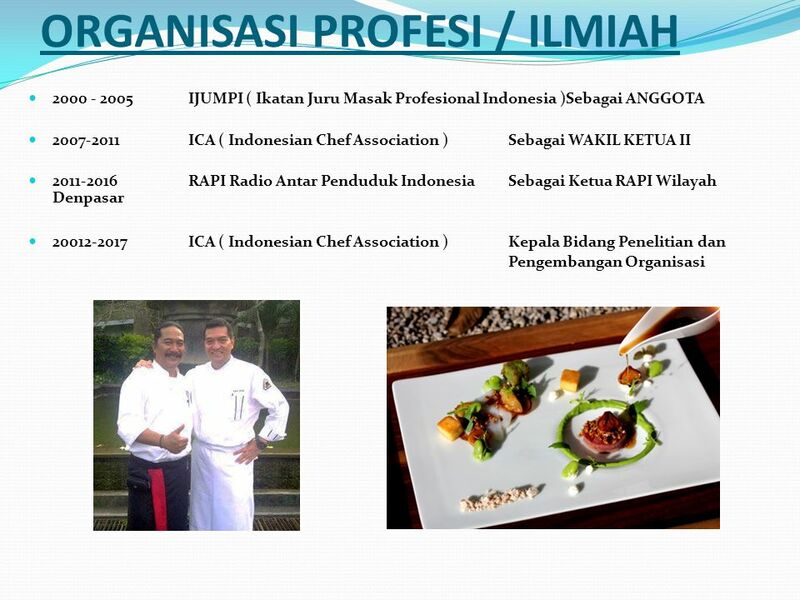 2 VISI Kami menjadi konsultan bidang Jasa yang bergerak didunia Perhotelan yang menyangkut bidang Kitchen, Restorant / Cafe, Bar, Hotel dan Pemasaran serta kaitannya, dengan selalu memberikan solusi yang Inovative sehingga setiap Mitra kami mampu bersaing dalam skala Nasional dan Internasional. 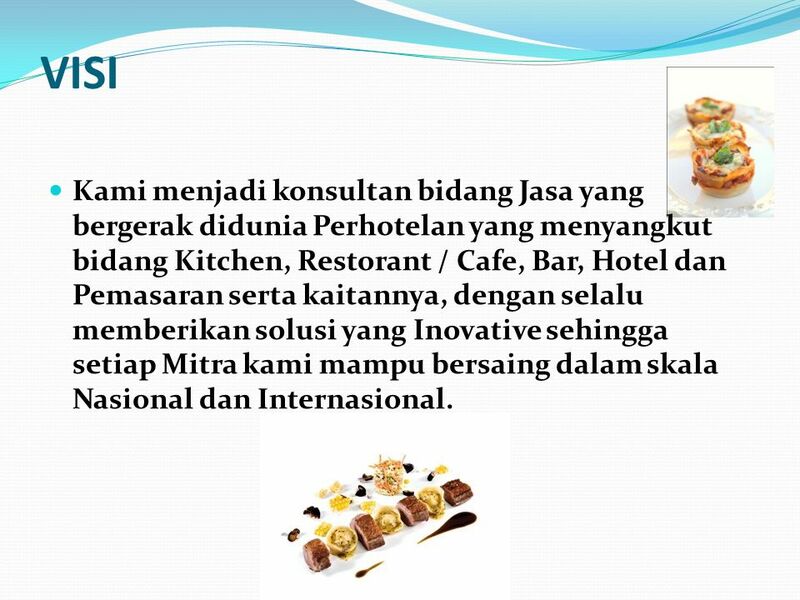 3 MISI Duzanta & Partner’s Consultan terbentuk dalam keinginan membantu Mitra dalam bidang Perhotelan dan selalu mengikuti trend trend yang up to date, sehingga Mitra mampu bersaing dalam skala Nasional dan Internasional. Kami adalah bergerak di bidang Jasa khususnya Perhotelan serta kaitannya yang berhubungan dengan Perhotelan dengan Nilai tambah kepada setiap Mitra yang menjalin Kerjasama dengan kami berdasarkan : Berorientasi Kemitraan Efektifitas dan Efisiensi atas Solusi Inovasi yang berkesinambungan Kualitas dan Profesionalisme kerja yang tinggi Komitmen dalam setiap Pelayanan. 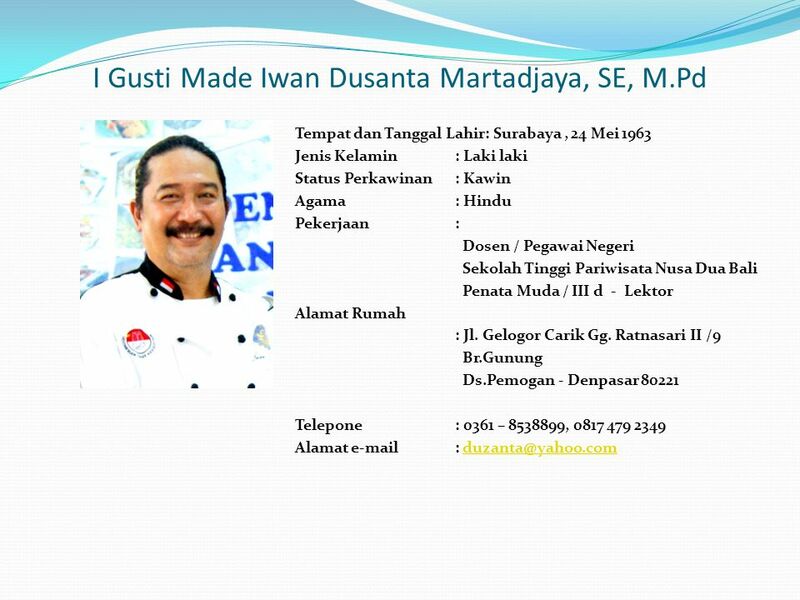 Duzanta & Partner’s Consultan adalah orang orang yang sudah berpengalaman dan mengerti pada bidangnya masing masing dan dalam keterkaitannya / hubungan dalam menjalankan usaha Consultan. Adalah bentuk pelayanan Duzanta & Partner’s Konsultan terhadap Mitra dimana kami membantu dalam Pre-Opening, Preparation, System, Recruiting, Training dan Controling sampai tahap Operacional berlangsung dengan Kualitas dan Profesional yang terjamin serta dengan harga yang Kompetitif. Sehingga Duzanta & Partner’s Konsultan memberikan pelayanan Jasa Perhotelan dan Pengembangan Jasa yang berkualitas, Inovatif, dan tentunya dapat memenuhi kebutuhan Mitra, sehingga mencapai hasil yang dapat memberikan Value yang berharga bagi Mitra. Semua dilakukan untuk membantu Mitra melakukan segala sesuatu menjadi lebih mudah dicapai dan dengan cara yang menyenangkan. 2003	OPENING TEAM LEADER DELICIO CAFÉ & BAKERY LOMBOK 2003	TEAM LEADER ARTIST of THE MONTH DELICIO CAFÉ & BAKERY Present NUGGIE 2003	TEAM LEADER ARTIST of THE MONTH DELICIO CAFÉ & BAKERYPresent BABY ROMEO 2004	F&B COORDINATOR TEAM POWER GEN NEW YEAR CELEBRATION for 1500 PAX 2005	F&B COORDINATOR TEAM POWER GEN INDEPENCE DAY for INDONESIA CELEBRATION for 1500 PAX 2005	F&B COORDINATOR TEAM YTL POWER NEW YEAR CELEBRATION for 1500 PAX 2006	TEAM LEADER BROMO PERMAI HOTEL 1 NEW YEAR CELEBRATION 2007	ACTIVITIES SUPPORTING TEAM HOTEL CONSORSIUM & BROMO TENGGER NATIONAL PARK INDONESIA INDEPENCE DAY CELEBRATION. 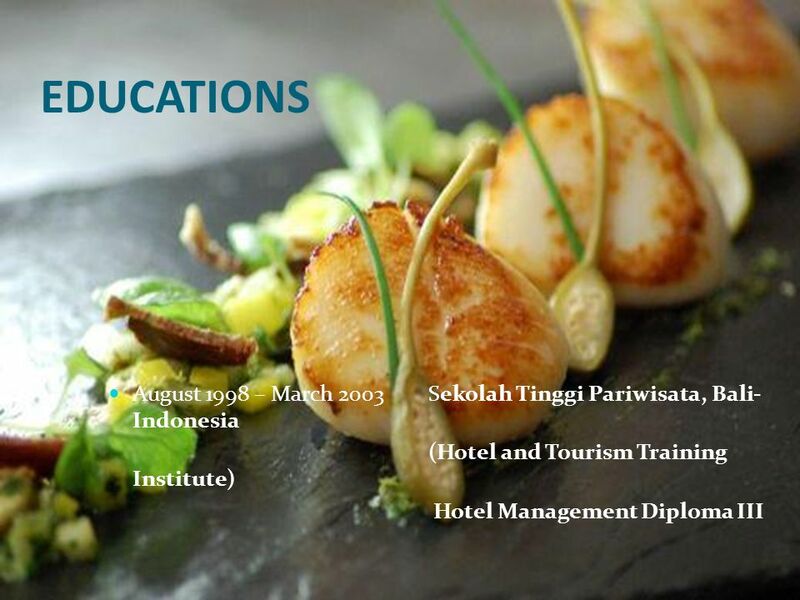 2010	BROMO VIEW HOTEL TEAM LEADER for EAST JAVA FOOD COMPETITION. 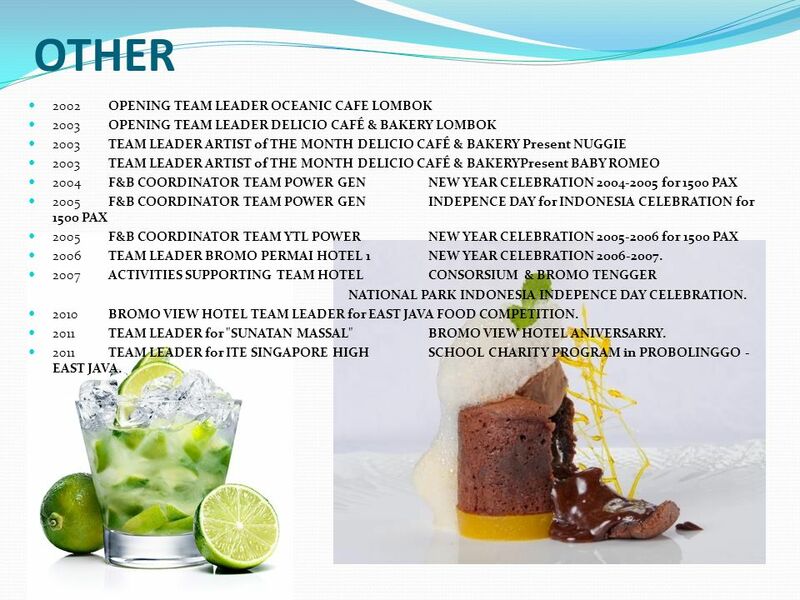 2011	TEAM LEADER for "SUNATAN MASSAL" BROMO VIEW HOTEL ANIVERSARRY. 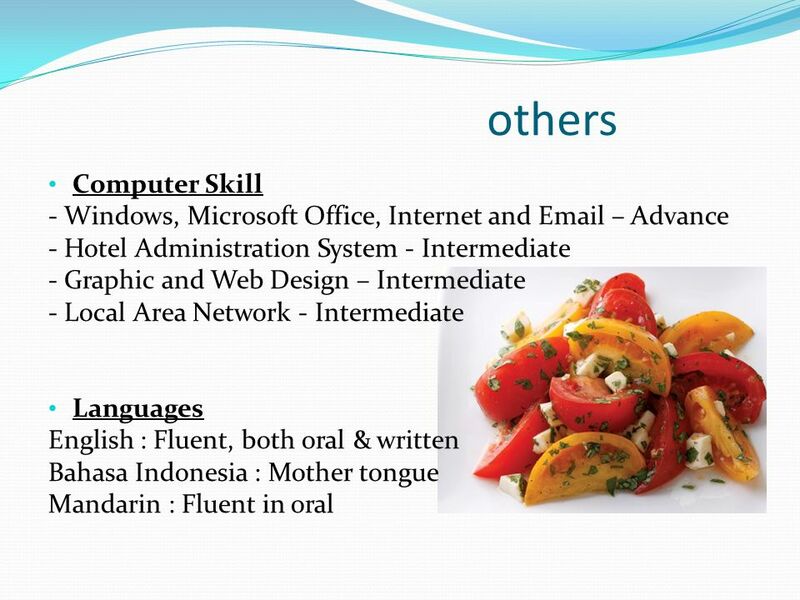 2011	TEAM LEADER for ITE SINGAPORE HIGH SCHOOL CHARITY PROGRAM in PROBOLINGGO - EAST JAVA. 20 Erni Lee Limtawati Address : Jl. Gunung Kalimutu XIX No. 20. 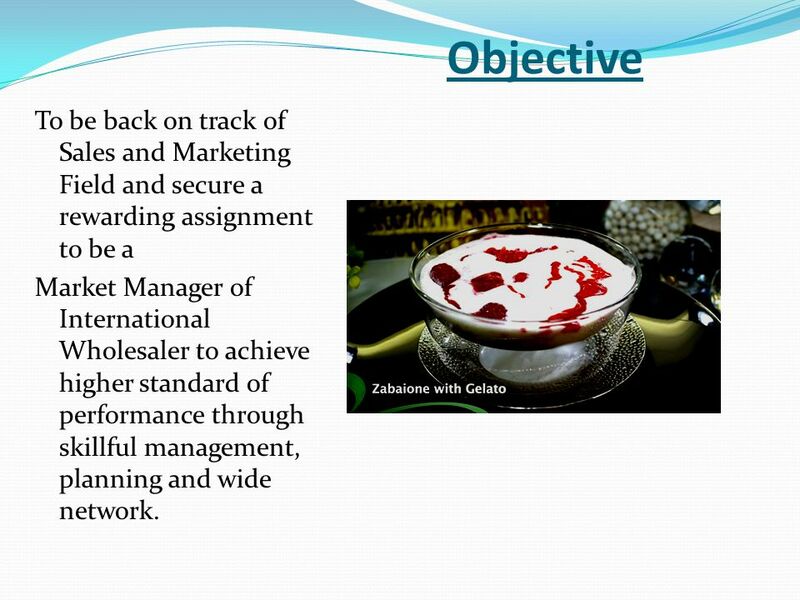 21 Objective To be back on track of Sales and Marketing Field and secure a rewarding assignment to be a Market Manager of International Wholesaler to achieve higher standard of performance through skillful management, planning and wide network. 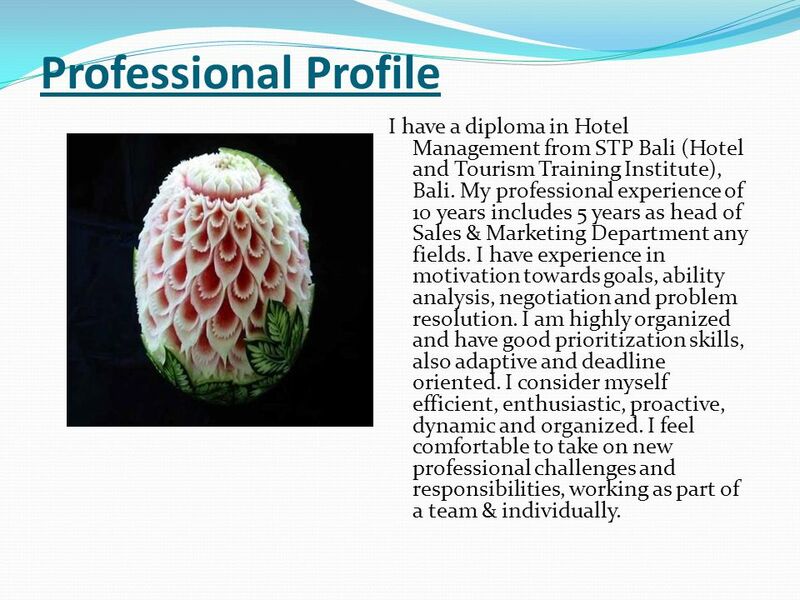 22 Professional Profile I have a diploma in Hotel Management from STP Bali (Hotel and Tourism Training Institute), Bali. 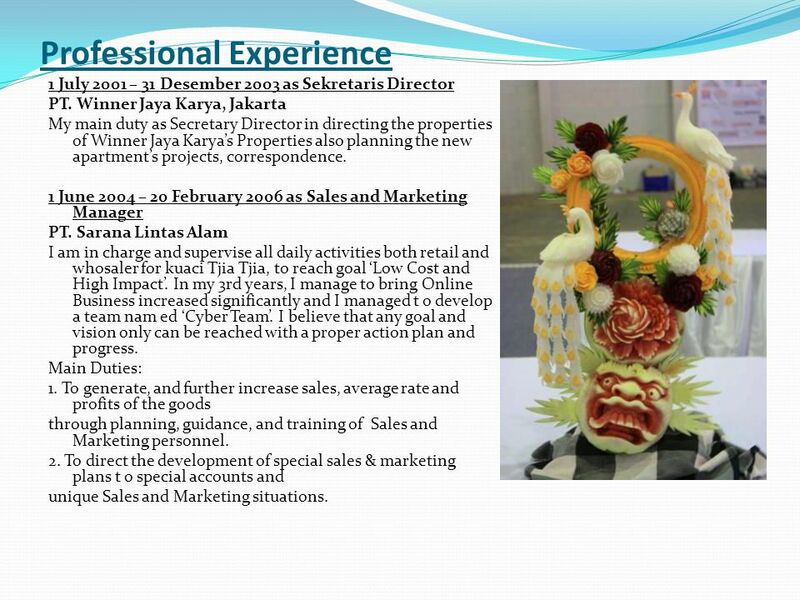 My professional experience of 10 years includes 5 years as head of Sales & Marketing Department any fields. 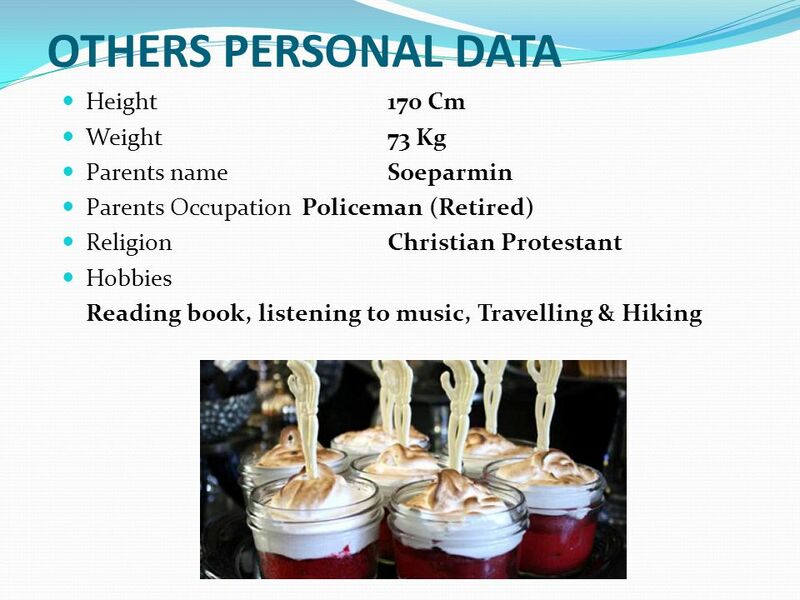 I have experience in motivation towards goals, ability analysis, negotiation and problem resolution. 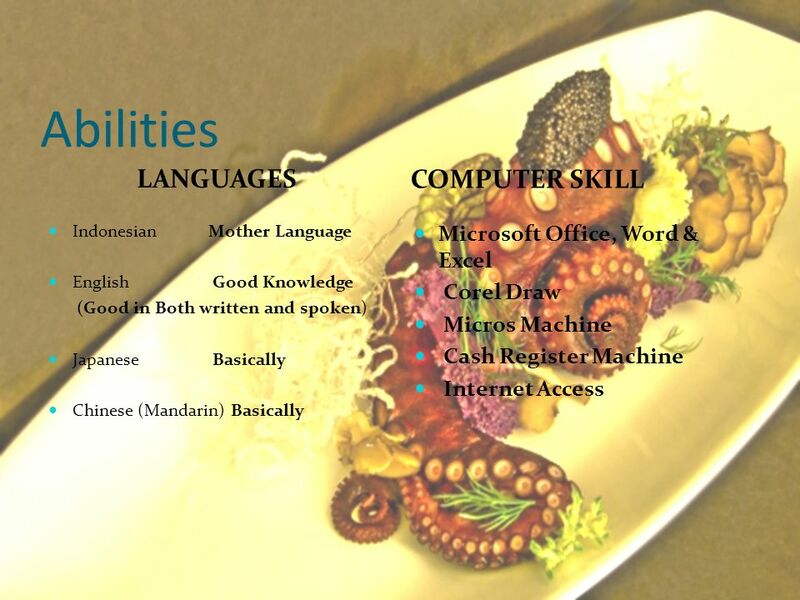 I am highly organized and have good prioritization skills, also adaptive and deadline oriented. I consider myself efficient, enthusiastic, proactive, dynamic and organized. I feel comfortable to take on new professional challenges and responsibilities, working as part of a team & individually. 1 July 2001 – 31 Desember 2003 as Sekretaris Director PT. 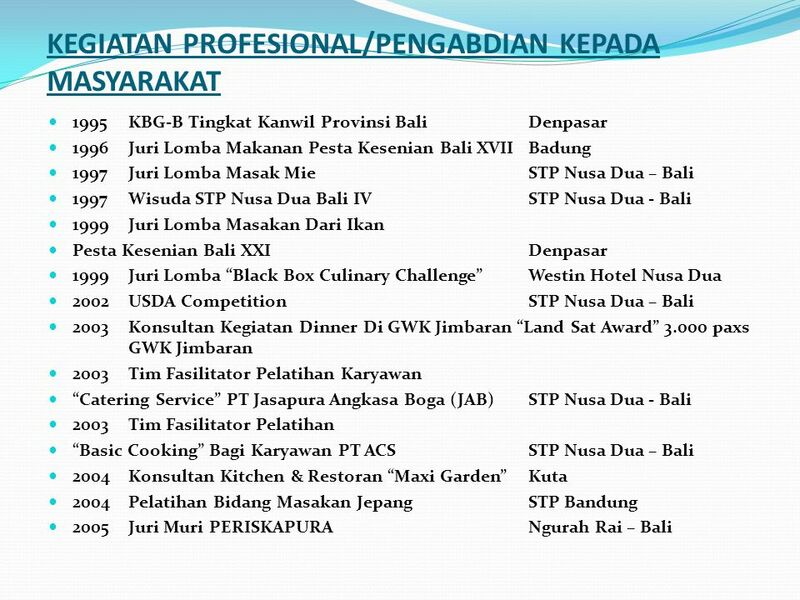 Winner Jaya Karya, Jakarta My main duty as Secretary Director in directing the properties of Winner Jaya Karya’s Properties also planning the new apartment’s projects, correspondence. 1 June 2004 – 20 February 2006 as Sales and Marketing Manager PT. Sarana Lintas Alam I am in charge and supervise all daily activities both retail and whosaler for kuaci Tjia Tjia, to reach goal ‘Low Cost and High Impact’. In my 3rd years, I manage to bring Online Business increased significantly and I managed t o develop a team nam ed ‘Cyber Team’. I believe that any goal and vision only can be reached with a proper action plan and progress. Main Duties: 1. To generate, and further increase sales, average rate and profits of the goods through planning, guidance, and training of Sales and Marketing personnel. 2. To direct the development of special sales & marketing plans t o special accounts and unique Sales and Marketing situations. 3. 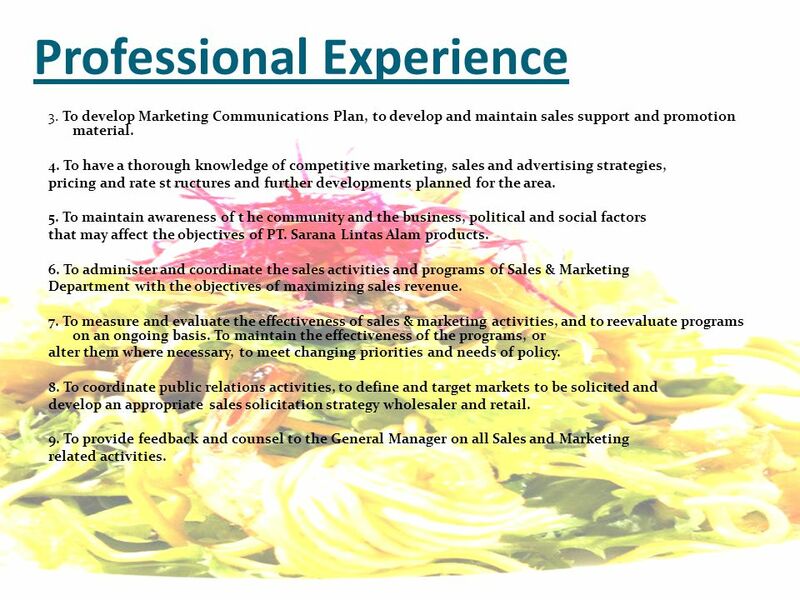 To develop Marketing Communications Plan, to develop and maintain sales support and promotion material. 4. To have a thorough knowledge of competitive marketing, sales and advertising strategies, pricing and rate st ructures and further developments planned for the area. 5. To maintain awareness of t he community and the business, political and social factors that may affect the objectives of PT. 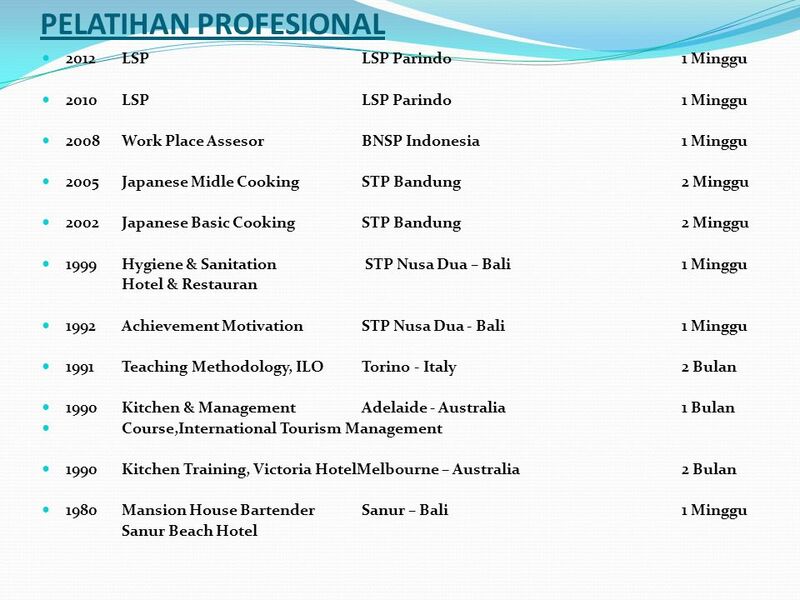 Sarana Lintas Alam products. 6. To administer and coordinate the sales activities and programs of Sales & Marketing Department with the objectives of maximizing sales revenue. 7. To measure and evaluate the effectiveness of sales & marketing activities, and to reevaluate programs on an ongoing basis. To maintain the effectiveness of the programs, or alter them where necessary, to meet changing priorities and needs of policy. 8. To coordinate public relations activities, to define and target markets to be solicited and develop an appropriate sales solicitation strategy wholesaler and retail. 9. 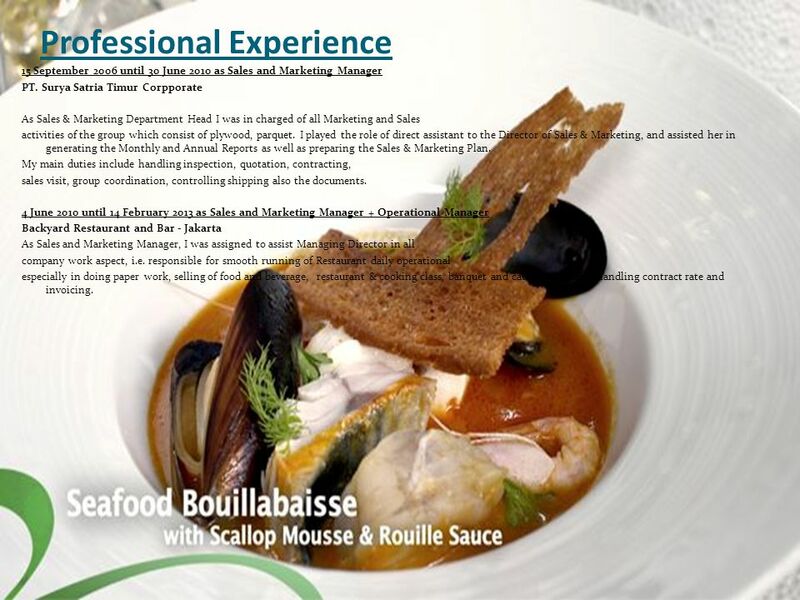 To provide feedback and counsel to the General Manager on all Sales and Marketing related activities. 15 September 2006 until 30 June 2010 as Sales and Marketing Manager PT. Surya Satria Timur Corpporate As Sales & Marketing Department Head I was in charged of all Marketing and Sales activities of the group which consist of plywood, parquet. I played the role of direct assistant to the Director of Sales & Marketing, and assisted her in generating the Monthly and Annual Reports as well as preparing the Sales & Marketing Plan. My main duties include handling inspection, quotation, contracting, sales visit, group coordination, controlling shipping also the documents. 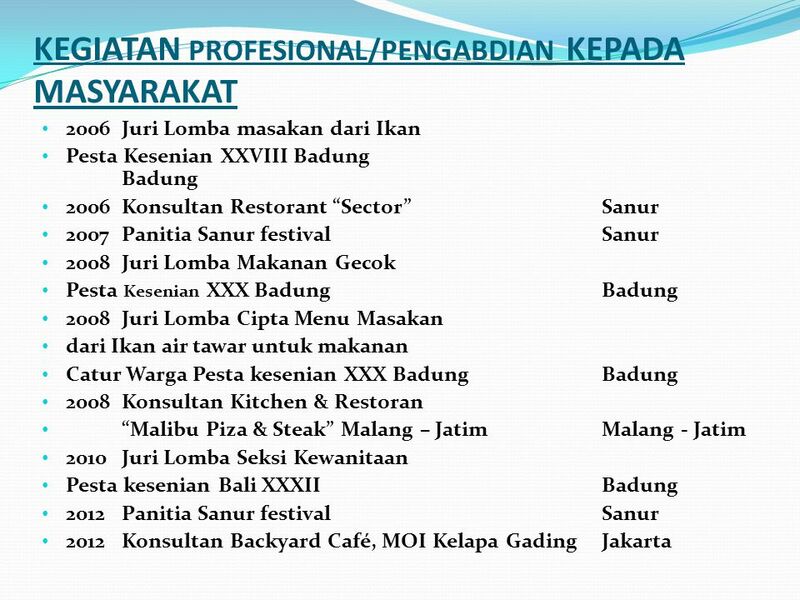 4 June 2010 until 14 February 2013 as Sales and Marketing Manager + Operational Manager Backyard Restaurant and Bar - Jakarta As Sales and Marketing Manager, I was assigned to assist Managing Director in all company work aspect, i.e. 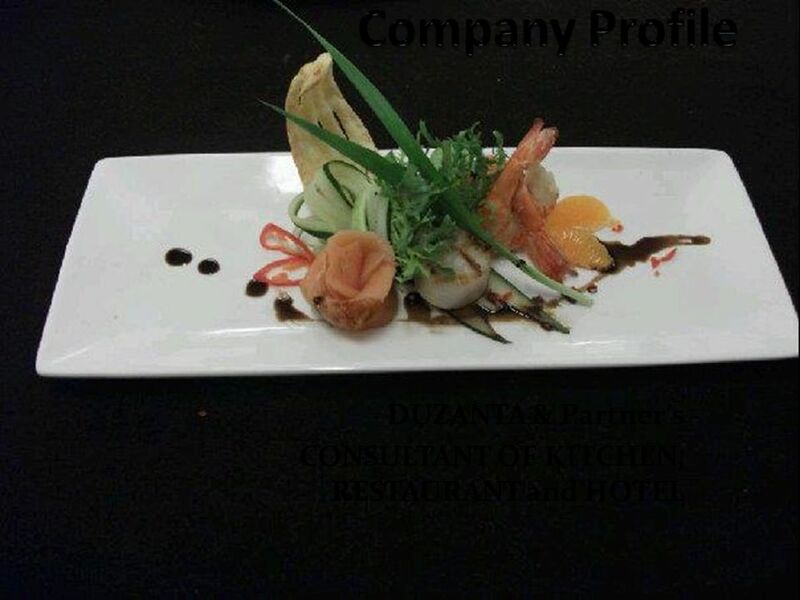 responsible for smooth running of Restaurant daily operational especially in doing paper work, selling of food and beverage, restaurant & cooking class, banquet and catering services, handling contract rate and invoicing. Grand Hyatt Hotel Bali, Nusa Dua, Bali. I was still in college when I did this job. The scope of work was welcoming guests, escorting guests to the room, giving information on all hotel facilities, receiving complaint and up selling. 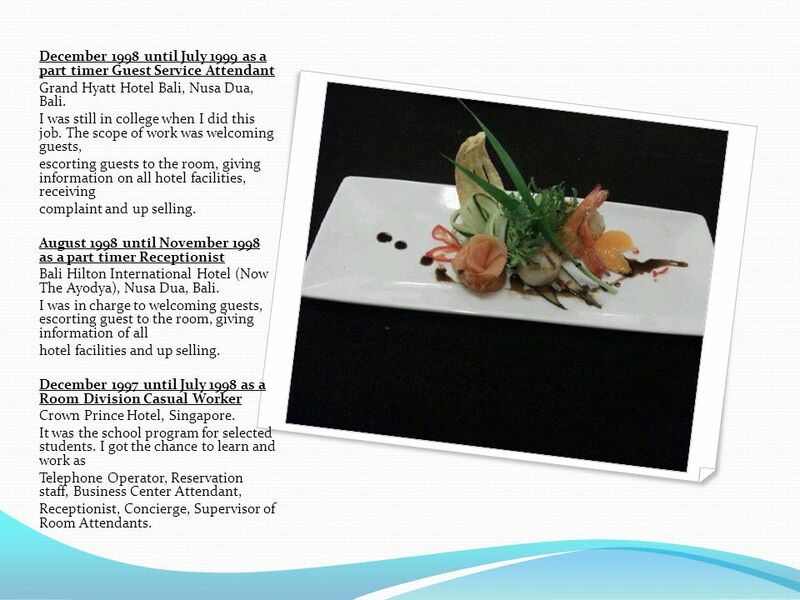 August 1998 until November as a part timer Receptionist Bali Hilton International Hotel (Now The Ayodya), Nusa Dua, Bali. I was in charge to welcoming guests, escorting guest to the room, giving information of all hotel facilities and up selling. December 1997 until July 1998 as a Room Division Casual Worker Crown Prince Hotel, Singapore. It was the school program for selected students. I got the chance to learn and work as Telephone Operator, Reservation staff, Business Center Attendant, Receptionist, Concierge, Supervisor of Room Attendants. 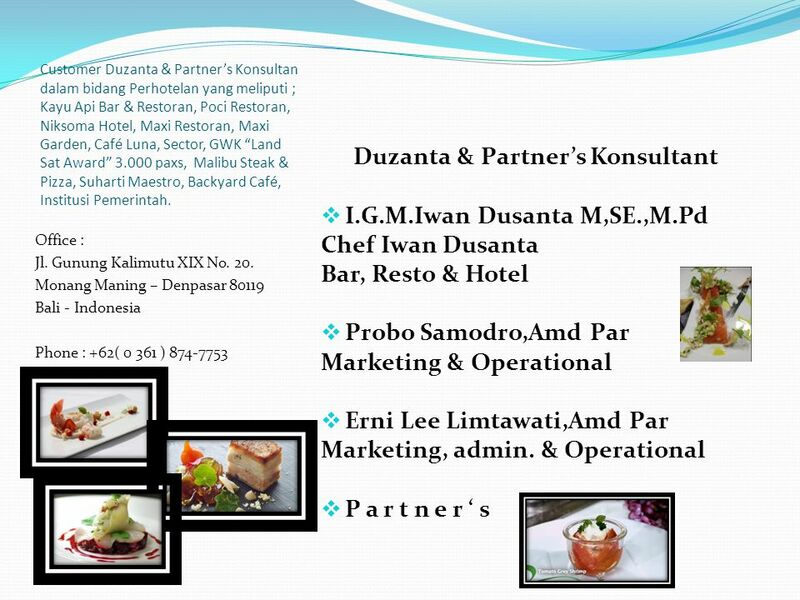 Download ppt "DUZANTA & Partner’s CONSULTANT OF KITCHEN, RESTAURANT and HOTEL"
Aplikasi Komputer dalam MRK batagem.com. Aplikasi Komputer dalam MK2 Komputer dan Konstruksi? Normative cost per unit value Construction Automobiles. Outsource Sales Department For Your Business By. 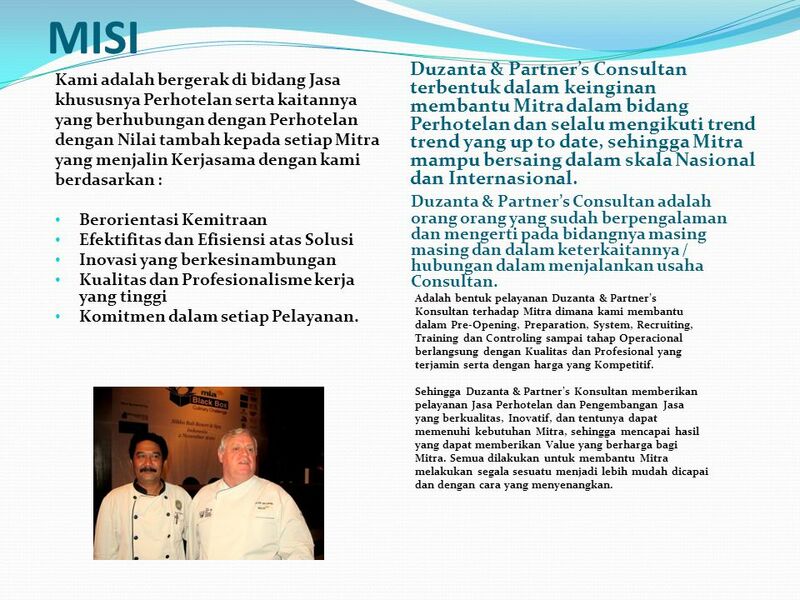 Solution Business Consulting Solution Business Consulting 2012. 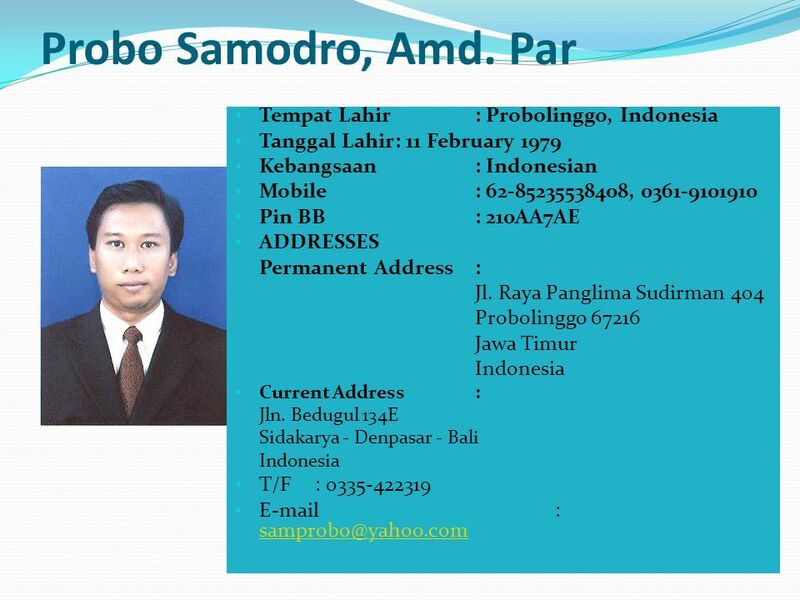 Aspek Sosial & Organisasi Restyandito, S.Kom, MSIS. Copyright © 2007 – Badan Meteorologi dan Geofisika. Company LOGO PRINSIP-PRINSIP TUTORIAL. Structured, Teacher Centered, identified task (Entwistle & Thomson, 1992) Unstructured, student centered, discussion/dial. 1 Professional Ethics Each Profession has following characteristics: Knowledge, expertise, and methods; Professional autonomy; Internal Monitoring to produce. PT MULTI DAYA OPTIMA Jl. 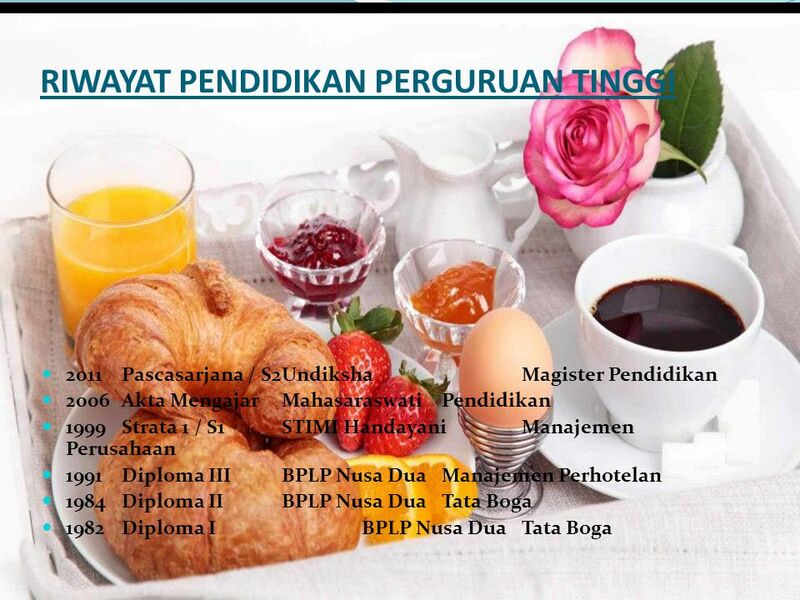 Pendidikan No. 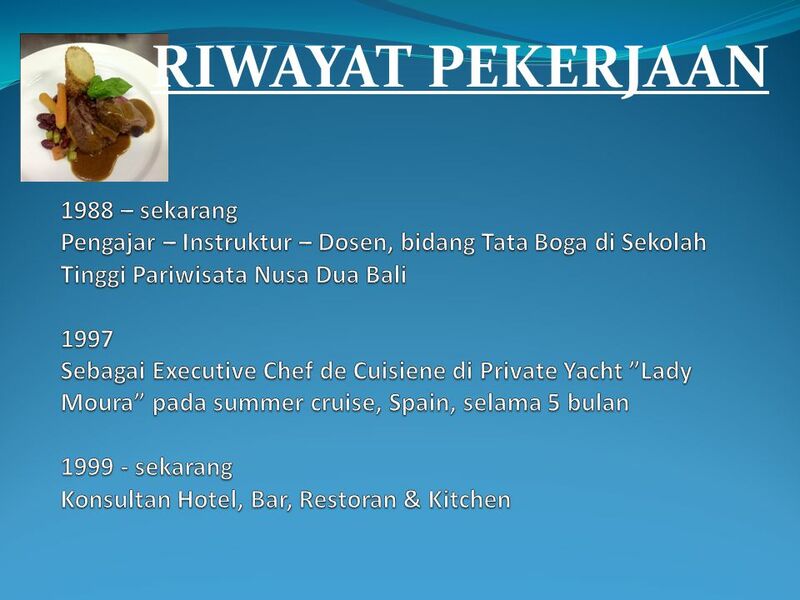 12A, Cilandak - Jakarta Selatan Tel : 62-21-7695458, 62-21-75902788 Fax : 62-21-75905344.